SAUDI KING CALLS FOR CONFRONTATION OF DEVIANT IDEOLOGIES AND THE COUNTERJIHAD AGREES……! – The Tundra Tabloids……. 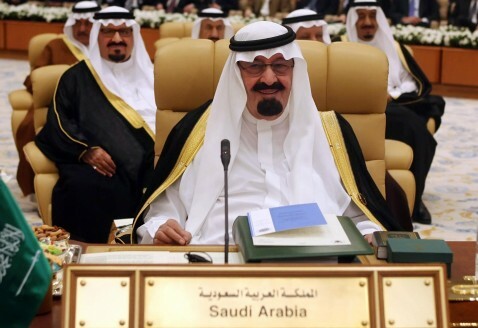 SAUDI KING CALLS FOR CONFRONTATION OF DEVIANT IDEOLOGIES AND THE COUNTERJIHAD AGREES……! OK! The Saudi Kingdom is the chief promoter and disseminator of orthodox, or wahabist Islam, around the world, as they compete with Iran for the hearts and minds of the world’s Muslims. Their dawa, or outreach missionary work towards the non-Muslim is well funded too, and chiefly responsible for the radicalization of the hundreds of millions of Muslims and new converts to Islam around the world. The Saudi King’s demand for the confrontation of all deviant ideologies has already been taken up by the counterjihad, which seeks to stunt and limit the impact of Islam, in all of its flavors, within the West through education, networking and political activism. So yes, the confrontation of deviant ideologies has been taken seriously here in Europe, the US, Canada and in Australia, by people who are as disgusted with the ideology of Islam as they are with the socialist ideologies of Fascism and Communism and political correctness (read = cultural marxism). NOTE: Laugh hard at a quote taken from the article, it’s funny because he spoke while maintaining a straight face. MECCA, Nov 22 (Bernama) — Muslims are still paying a heavy price for the 9/11 incident and are losing out more with every act of terror, the Custodian of Islam’s two holiest mosques King Abdullah was reported as saying by Saudi Arabia’s English daily, Arab News. “Enmity from within, which is the most perilous, can be seen in attempts to kidnap moderate Islam by gangs of ignorant people who propagate rigidity out of fear of everything that is new� without any consideration for the rules of the religion,” said the king in his opening speech of the Muslim World League’s 10th annual convention here Saturday. His speech was read out on his behalf by Mecca Governor Prince Khaled Al-Faisal. “Despite the fact that the (Saudi) Kingdom practices moderation and came into existence under the banner of Islam, it has suffered a lot because of a devious politicised doctrine which has sneaked incognito into the country,” he said. He pointed out that the Kingdom had been successful to a great extent in removing deviant ideologies and closing all doors to them. He was referring to the extremist ideologies propagated by Al-Qaeda supporters. The king urged Islamic scholars and organisations to stand firmly against deviant ideologies in order to protect Muslim societies from their proponents’ nefarious designs and prevent their further spread among Muslim youths. He said enemies of Islam and Muslims were mobilising their political machinery and the media “to distort our image and create hatred against us.” He blamed the irresponsible actions of a few for the anti-Islam campaign. King Abdullah urged Muslims to play an important role in rebuilding human civilization in this age of science and technology. “We have to pay more attention to human development and teach our youths contemporary sciences and technologies while giving utmost attention to Shariah subjects and remaining committed to the Islamic constitution,” he said. NOTE: Islam has been taking stealing science and technology from the West for centuries, it’s just interesting that the Saudi King admits to it being halal. Previous Post Previous Post UK: BRITISH ‘ASIAN’ NEWSCASTER FILES CHARGES OF DISCIMINATION AFTER BEING REPLACED BY FOUR BLONDES……. Next Post Next Post RESTORATION WEEKEND: RIFQA BARY CASE DISCUSSED BY GELLER, SPENCER AND BOSTOM…….